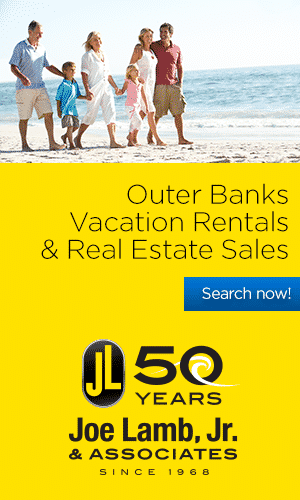 Outer Banks beaches are very Fido-friendly and can be fun for both pets and their owners. However, never leave your pet unattended, and please be courteous and clean up after your pet. 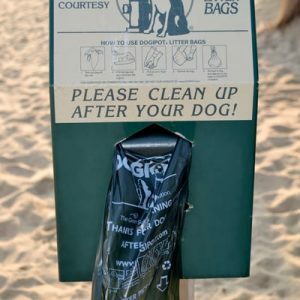 You will find pet waste bags at the entrance of almost every beach access (or bring your own bags). All pet waste must be collected immediately and deposited in garbage cans. Please don’t just kick sand over it…people walk, play, and dig in the sand. Many dogs love the beach. But there are some hazards to be aware of, especially if they’re used to the city, suburbs, or if they typically lead a sedentary life. Here are some important tips to keep our beloved four-legged friends safe, happy, and healthy on the beach. Dogs are allowed on the beach year-round on a leash. Heritage Park at the Whalehead Club on the Currituck Sound welcomes leashed dogs as well. If collared with proper identification and proof of rabies vaccination, dogs are welcome on a 10’ lead throughout Town, including the boardwalk, Duck Trail, and Duck Park. While at the park, pet owners will be happy to find a dog-friendly water fountain near the playground. Year-round, dogs may be on the beach without a leash as long as they remain under the watchful eyes of their owner and return when commanded. Pets must be kept on a leash at all times. While dogs are welcome any time of day in the off-season, they are also permitted on the beach from 6pm – 9am during in-season (May 15th through September 15th). From the Friday before Memorial Day to the day after Labor Day: 6pm to 10am dogs must be on a 12’ lead and 10am to 6pm on a 6’ lead. The rest of the year Fido may run on the beach leash-free as long as he stays within 30’ of his owner and returns when called. Dogs must be kept on a leash at all times. While dogs are welcome any time of day in the off-season, they are prohibited on beaches between 9 a.m. and 6 p.m. between Memorial Day and Labor Day (unless being used to aid a handicapped person). Pets are welcome at any of Nags Head town parks and beaches all day as long as they are on an 8’ leash. Dogs are welcome at Cape Hatteras National Seashore. Your pet must be on a 6’ leash at all times and are prohibited within any resource closure. Pets are not allowed on designated swim beaches or in buildings. If your pet is a horse, that’s ok, too! You may ride them anywhere vehicles are permitted to drive, except in campgrounds; horseback riding is prohibited in NPS campgrounds. Riders are required to use ORV ramps when crossing dunes.